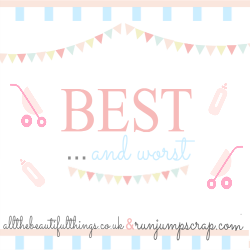 Hello and a big welcome to this weeks best and worst linky. We look forward to reading lots of new posts. This week is going quickly and here we are again, Wednesday and linky day. I cannot believe this is the 100th best and worst, amazing! Featured posts from last weeks link up are from Little Orange Dog Blog it made me giggle.....the part about the roundabout, intrigued....go have a read! Next up is from the lovely Fran over at Back with a Bump with a post that I could have written myself, blogging is definitely something I have had the odd wobble about recently. Getting Over a Traumatic Birth. Reasons to Buy Second Hand Furniture. *WIN* LeapFrog My Pal Violet! Save when you have a Baby on the Way!